The following article by Brian Johnson was published in the March 31, 2015 issue of Finance and Commerce. The city of Minneapolis is looking for an owner’s representative for the public park that will be created within the $420 million Downtown East mixed-used project in downtown Minneapolis. In a request for proposals, the city said the selected consultant will “represent the city’s interests during the design and construction phases” of the nearly $20 million Downtown East Commons park. The consultant will also collaborate with stakeholders, review design development and construction drawings, assist in the bidding process, and help oversee the construction project, among other duties. Proposals are due April 17 and the city plans to select the consultant in June. City spokesman Matt Lindstrom said initial visuals for the project will be unveiled at a public meeting scheduled for 7:30 p.m. April 8 at the Mill City Museum, 704 S. Second St. in Minneapolis. In January, the city chose San Francisco-based Hargreaves Associates to lead the design of the park, which will be on the city blocks surrounded by Park Avenue, Fourth Street, Fifth Street and Fifth Avenue. 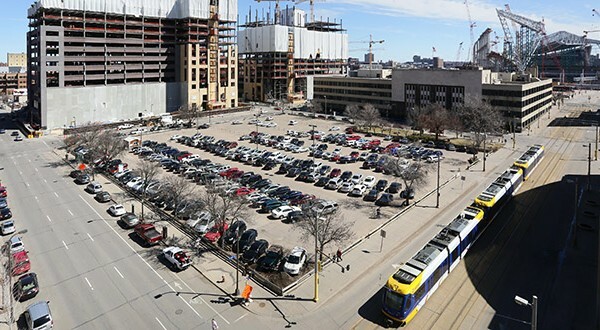 The project’s first phase, scheduled for completion in July 2016, includes demolition of the Star Tribune building at 425 Portland Ave. S. on the east side of the site, site preparation and grading, basic utility work and other duties. The city hopes to complete the next phase of construction, known as the “Ultimate Commons,” by the time the Super Bowl comes to Minneapolis in 2018. The project team is in the early design process for that phase. Lindstrom said the cost for the “basic park” is about $19.8 million. “This reflects the cost to purchase the land, clear it, and make basic improvements to it such as sidewalk replacement, streetlights, base electrical and irrigation, and seeded grass. Financing for these costs is in place,” Lindstrom said in an email. Downtown East Commons is part of Minneapolis-based Ryan Cos. 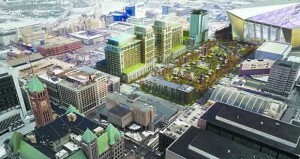 US Inc.’s Downtown East development, which includes two office towers for Wells Fargo, 200 housing units, retail space and a 1,600-stall parking ramp. Construction on Downtown East started last spring. The development is next to the new $1.06 billion Minnesota Vikings stadium, which is scheduled for completion in July 2016. This entry was posted in Downtown East Park on April 6, 2015 by citoyen1789.